Okay, I admit it. I got nothin' for this week. I'd filed in Saturday for The Posse and the scent I thought I'd write about for today just wasn't doing it for me, and not in an interesting way. What has been doing it for me recently is pasta, and pasta sauces. After my round of dental surgery I wasn't able to eat much, and after seeing a friend I hadn't seen in a couple of months (and weighing myself and looking in the mirror, it was getting a little "Rosemary's Baby" around the edges. Now, that's a look that a twenty-something Mia can get way with. On a fifty-something (did I just admit that in PRINT!?!) not so much. So I figured some carbs were in order. I like pasta, and I like pasta sauces. Everything from browning some hamburger meat and an an onion and adding jarred sauce (Silver Palate seems to be ever on sale at my local market and is great) to making home-made alfredo, which is easier than it would seem and a lot healthier. Cooks Illustrated and Cooks Country if you are a cooking enthusiast is a god-send to the home cook. They will exhaustively research the perfect way to cook anything you can think of ans walk you through the recipe step by step. You have to sign up and pay for their site but if you're cooking for a family and want easy and fool-proof recipes it's worth it. So what's your favorite past and sauce? 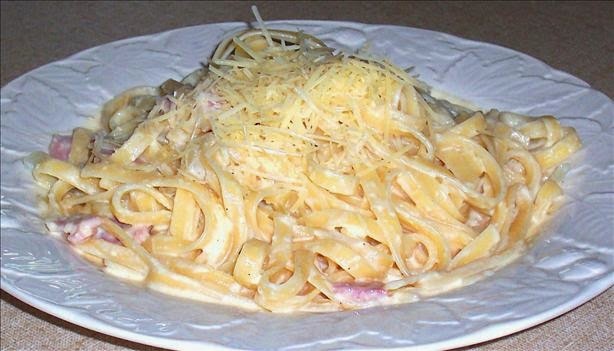 I think my all-time is fettuccine carbonara.. I've never found much of a difference in pastas, but as far as the sauce goes, I like Francesco Rinaldi's Sweet and Tasty Tomato on any brand of angel hair with a mix of Parmesan & Ramano generously sprinkled on top. Of course, I added additional spices and red pepper flakes to the sauce and let it simmer for an hour or so before using. Yum. Unfortunately I haven't been able to stomach tomato sauce in years because of a hiatal hernia and GERD. :-( Sure do miss Italian food! That stinks about the tomato sauce.